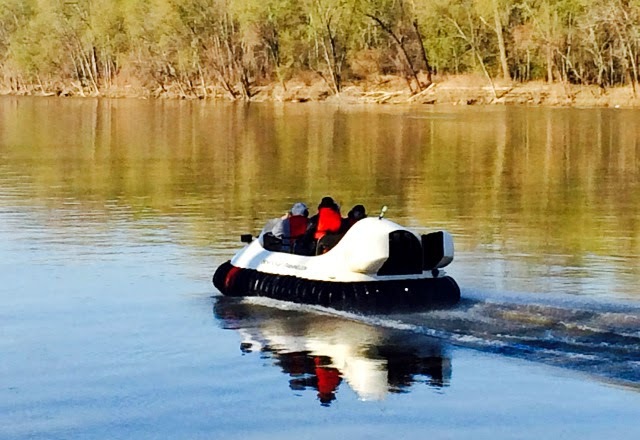 Hovercraft are not only all-weather, all-terrain vehicles – they’re all-ages vehicles, too! 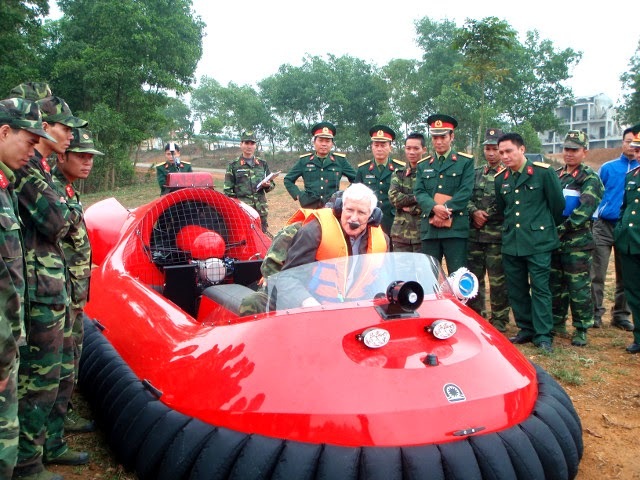 Hovercraft Training Centers’ graduates range from pre-teens to octogenarians. And when it comes to youth, HTC is actively involved in using hovercraft to enrich the educational experiences of students across the world. 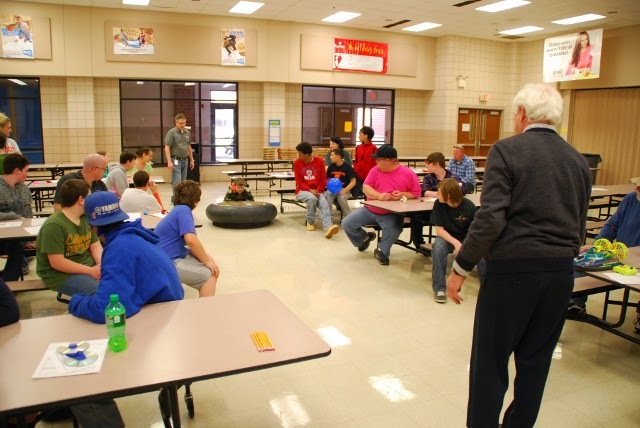 As an example, HTC founder and Senior Instructor Chris Fitzgerald recently spent a Saturday at Sarah Scott Middle School in Terre Haute, IN showing students how learning can soar to new heights with hovercraft. Sarah Scott technology instructor Mark Kirby was looking for a way to prepare his students for their upcoming ISTEP tests. 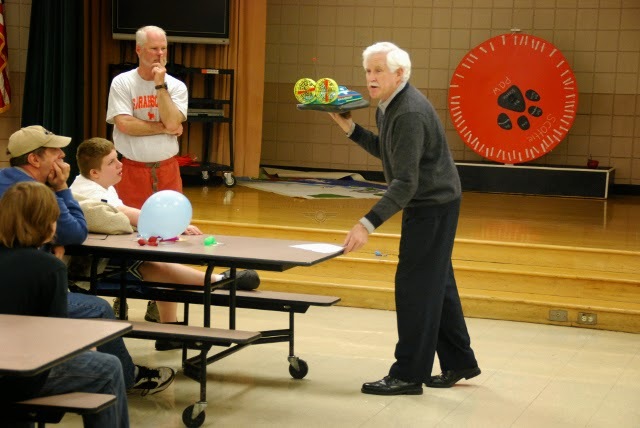 So he and his fellow teachers invited Fitzgerald to present a classroom session and take the kids for rides on an HTC Neoteric training hovercraft. 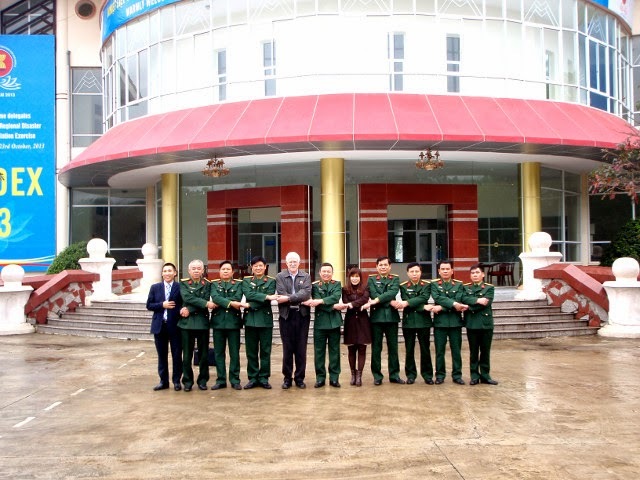 Besides learning all about hovercraft and the math and physics involved, the students played with remote controlled hovercraft and a hovering billiard ball built by Neoteric for the comedian Gallagher; they built their own hovercraft from CDs – and they were treated to actual rides in the HTC training hovercraft. leaf blower and equipped with jupe skirts. Gallagher’s were built with a billiard ball top, not attached on this model. 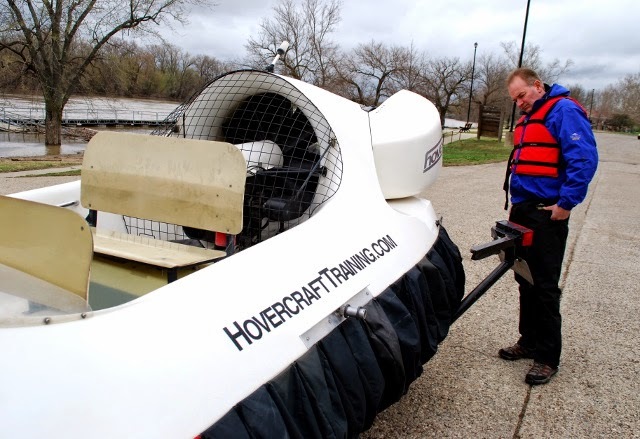 in trapping the cushion air under the hovercraft - how the skirt acts as a seal to hold air under the craft. 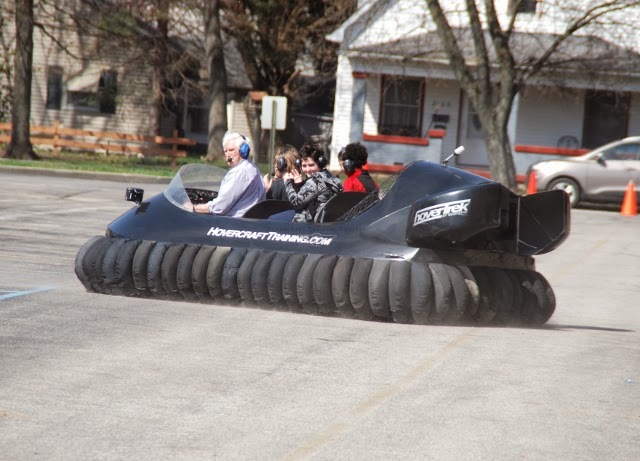 in a hovercraft around the school parking lot. The day was a huge success. Not only did the students discover that studying can be fun, there seems to be no doubt that their experience is likely to improve their ISTEP scores. 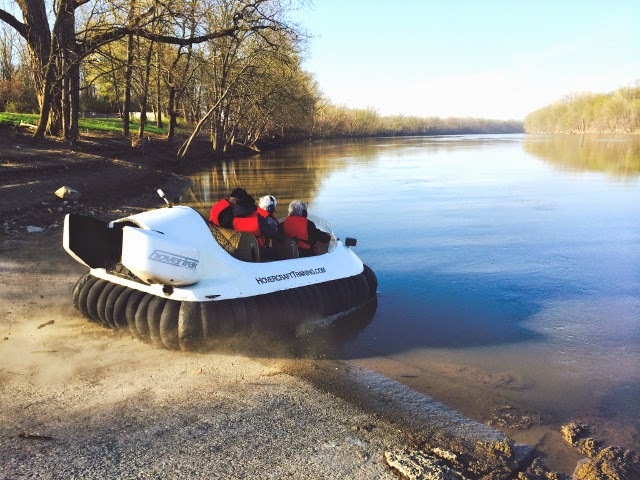 We at HTC encourage teachers, school administrators and parents worldwide to take advantage of the interest hovercraft arouse and how easily they can excite kids about math, physics and other areas of learning. 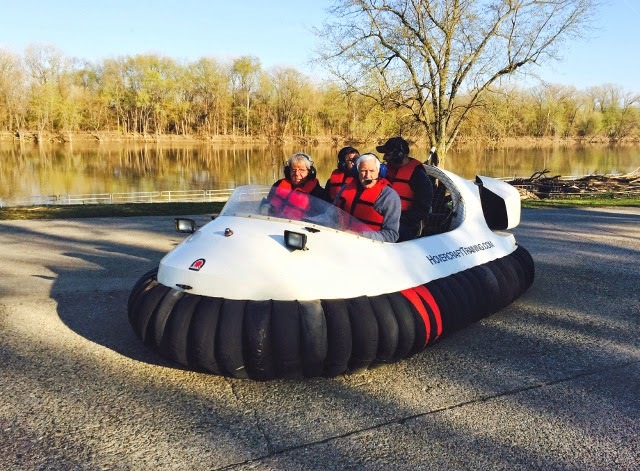 Studying is fun when it involves hovercraft! 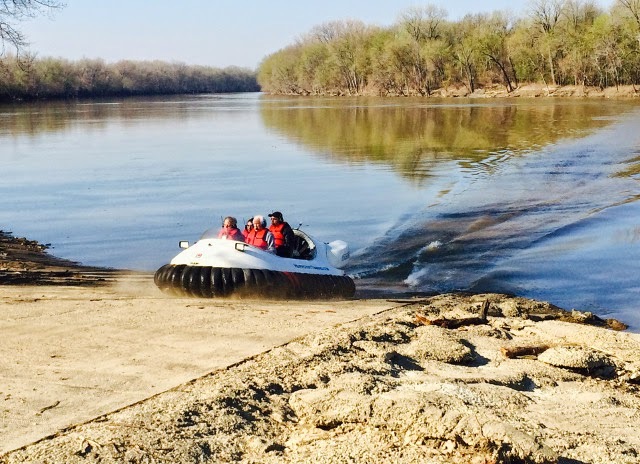 Seeing Hovercraft Training Centers’ graduates in the news for their mud rescue operations is becoming a commonplace occurrence. First, the headlines abounded with the vital role they played in the Washington mudslide rescue and recovery efforts – and this week in Texas, Wylie Fire-Rescue hit the news for an out-of-the-ordinary mud rescue operation. Wednesday night, 23-year-old Mario Otteson hitched a ride with a van full of teenage guys at a rest stop near Dallas. But he got far more than a ride! The teens stopped the van on the bridge over Lake Ray Hubbard, dragged Mario out, punched him several times, and then hurled him off the bridge into the lake. But Mario didn’t land in water. Because of drought conditions, water levels are low and he sunk instead into thick mud and couldn’t escape. Luckily he had a cell phone and called 9-1-1. 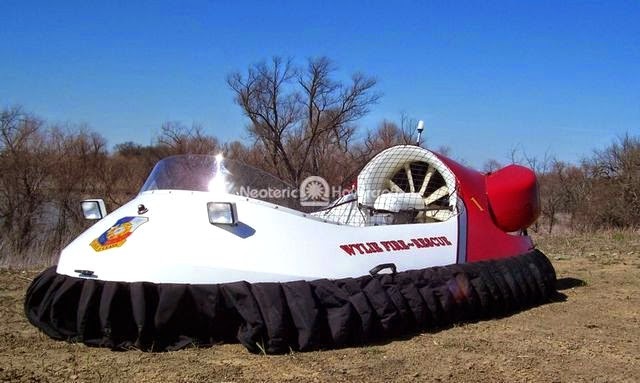 When the Dallas Police and Dallas Fire-Rescue couldn’t get him out of the mud, they knew to call someone who could: Wylie Fire-Rescue’s HTC-trained hovercraft pilots and their Neoteric Rescue HoverTrek™. 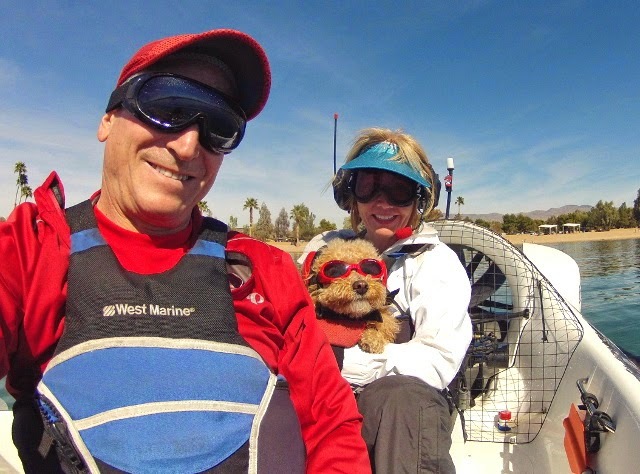 Wylie’s first responders quickly and easily flew their craft through the mire and extricated Mario, who fortunately suffered only a few scrapes but no serious injuries. 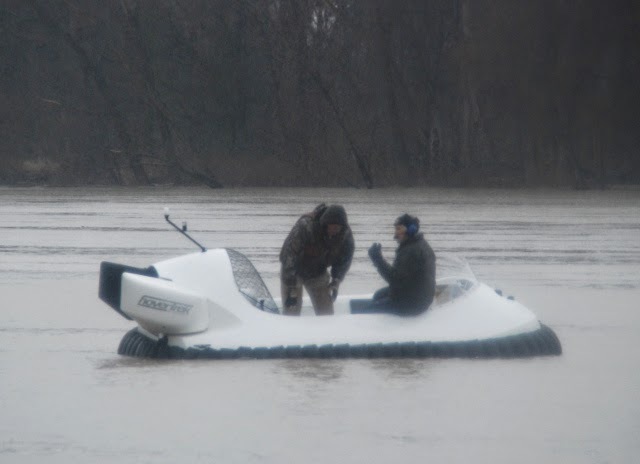 Here’s just another example of how important hovercraft and thorough training are to law enforcement and rescue agencies when they need to access areas that boats and even helicopters can’t reach. And we bet this is one hitchhiker who is now giving a real ‘thumbs up’ to HTC and Neoteric Hovercraft! 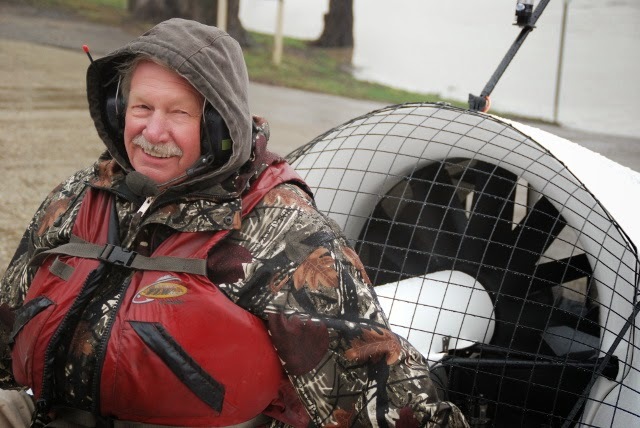 Larry Borland may not be a postman, but the postal creed, “Neither rain nor snow nor sleet nor hail shall keep the couriers from their appointed rounds” certainly applied to his training day at HTC! 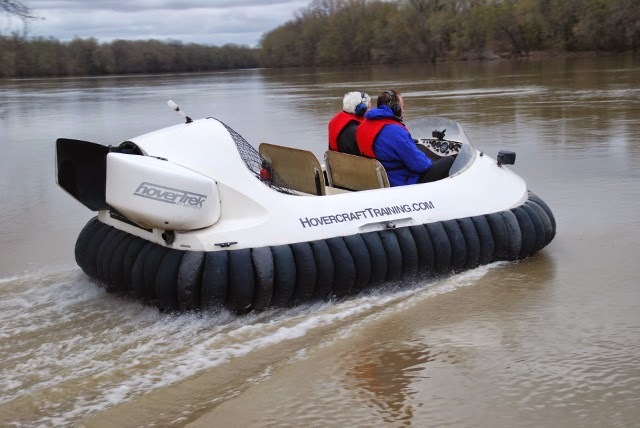 Just like a hovercraft can handle any sort of weather, so can Larry, a 71-year-old retired farmer from North Dakota. 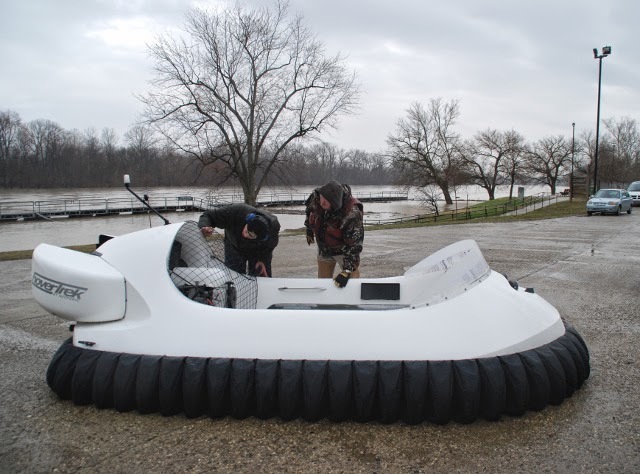 Braving a gray, rainy day and a fast-flowing, flooded Wabash River, Larry enthusiastically completed thorough – if soggy – pilot and maintenance training in his new Neoteric hovercraft last weekend at HTC headquarters. 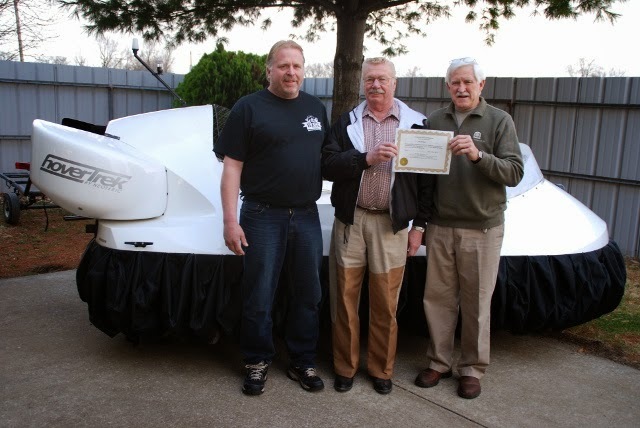 Here Larry (center), accompanied by his son Brent (left) receives his hovercraft pilot certification from HTC Senior Instructor Chris Fitzgerald. Of course, the rain let up after drenching him during his training! 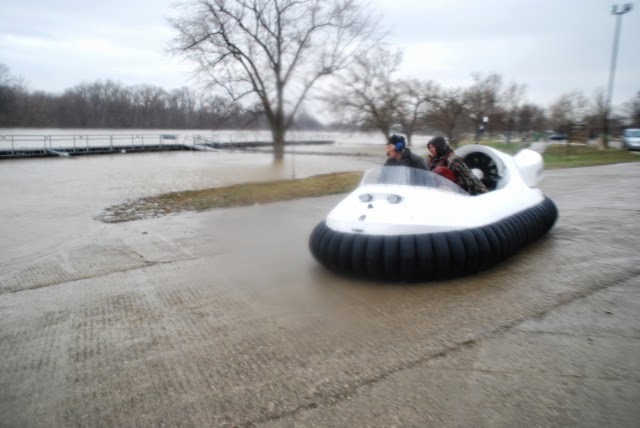 Larry first thought about buying a Neoteric hovercraft kit and building it himself, with some help from his son, Brent, who owns a repair shop, but then he decided to buy a fully-assembled craft. Judging from his expression as he starts his flight training, he seems to be pleased with it! 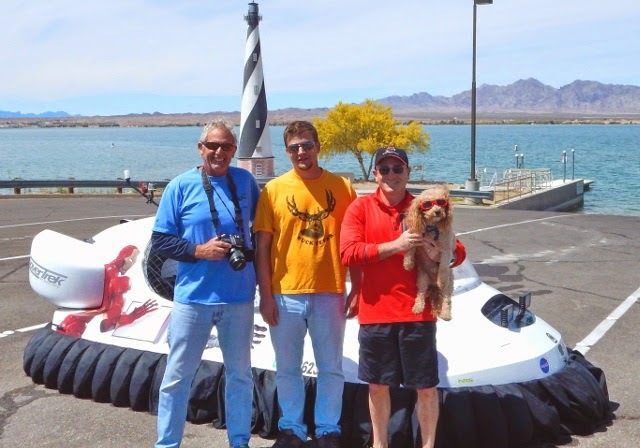 Brent, an avid outdoorsman, has a camper in a marina on the same lake, and another of Larry’s sons has a camper on another lake, so you can bet this hovercraft is going to be a family affair! 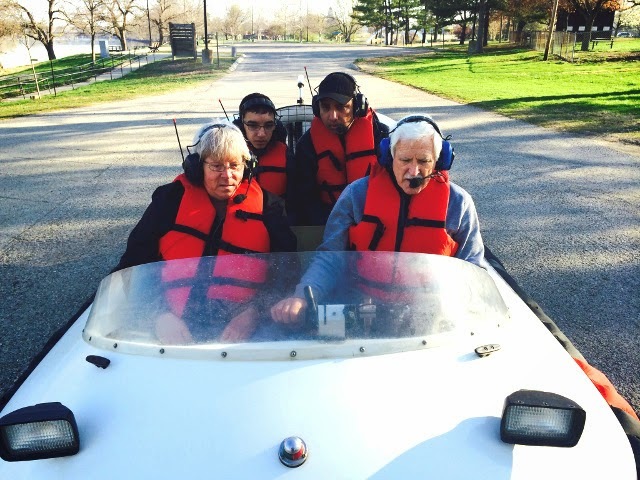 While learning to conduct a preflight inspection, Larry said even though he’d never been on a hovercraft before, he’d flown airplanes and had a “pretty good idea about how aerodynamics work," so he thought training would be fairly easy. 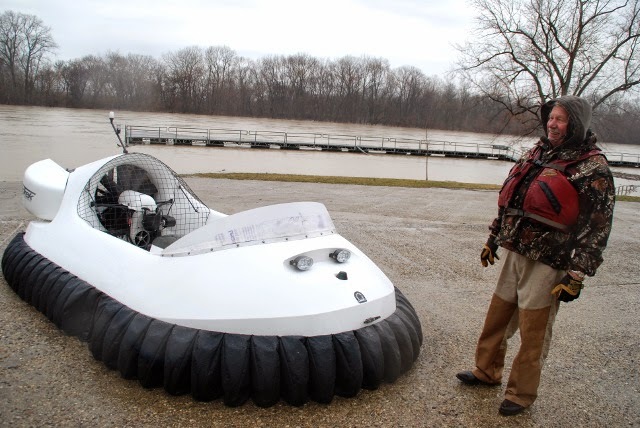 Before they launch the craft on the flooded Wabash River, Chris demonstrates to Larry the Neoteric HoverTrek’s patented reverse thrust system, which gives the craft the ability to spin, fly backwards and brake. “The brakes will be nice!” Larry observed. 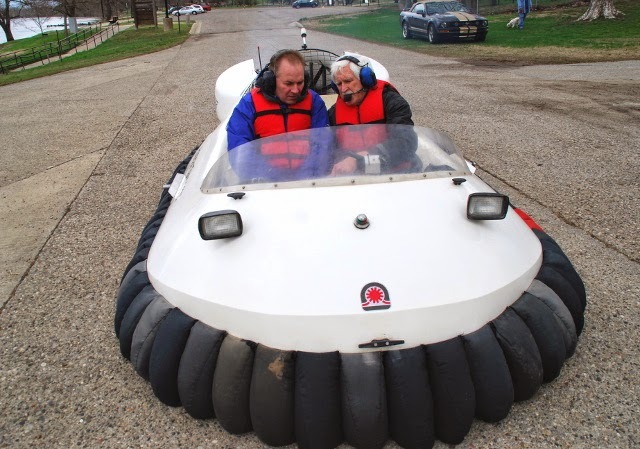 Out on the river, Chris shows Larry the extreme boat-like floating stability of the hovercraft – it’s certainly much more stable than the weather! 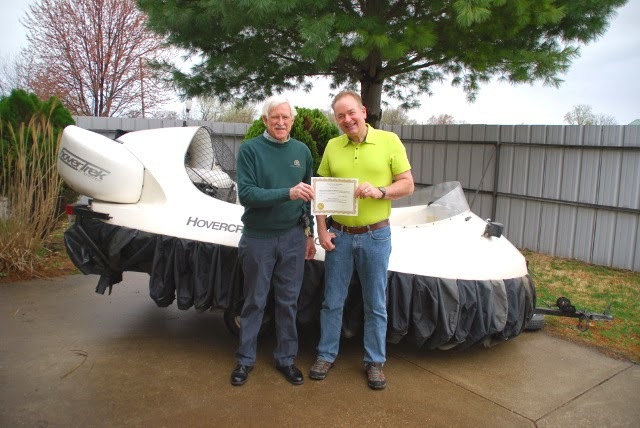 Now a fully-trained hovercraft pilot, Larry is ready to take his new craft back to North Dakota for some fun times ahead – hopefully in better weather! The HTC HoverPup – A paparazzi magnet! ... and learn how you can have some hover fun!